Welcome to Release Day at Taylored Expressions!!!! Today all the awesome new stamps and dies are available for purchase - check out the Fresh out of the Oven Tab at the TE store for all the newly released items as well as all crafty things that are new to the store! Today for my project, I am using the super cute new die from TE: the Arched Window die. What a fun die and it is so easy to create a scene of what's outside the window if you coordinate it with the From My Window stamp set or you can use it all by itself. I chose to use it all by itself and create a little scene using the papers from the Pebbles Seen and Noted (6x6) collection. I cut out the Arched Window die on Choice Snow White paper and then popped it up on some vellum paper and then die cut the top part of the arch onto some DP. I pretended that the gray chevron DP was like the wall of a house and then created a little scene with grass and a fence around it. The tree is from the In the Park stamp set and was colored with copics and then cut and popped up near the house. 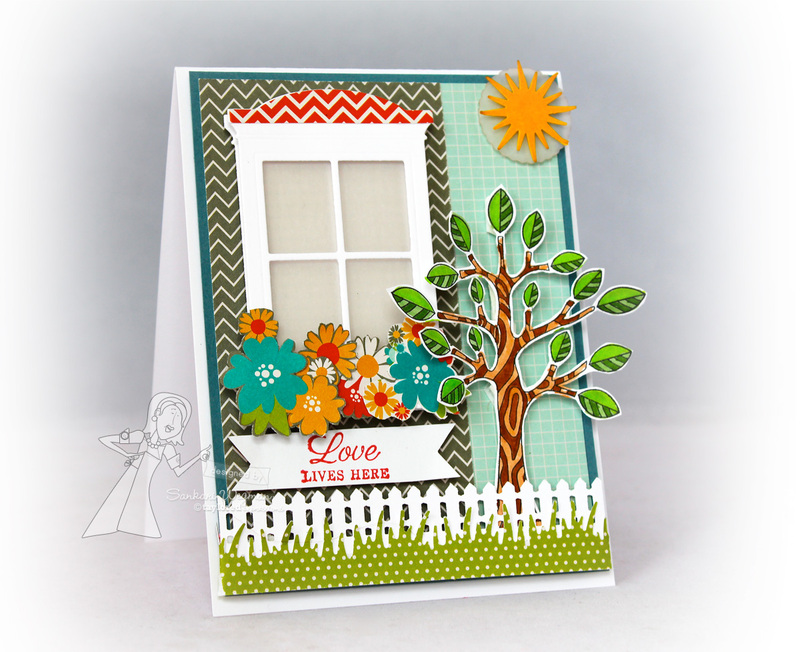 Accessories: Arched Window die and Grass Border die and Fence Border punch from MS, vellum, circle punch, star punch from MS, copics and dimensionals. Thanks so much for stopping by! Hope you can stop by tomorrow for a fun spotlight hop! Hope the scene outside of your window is a sunny one! This is stunning Sankari! I LOVE the scenes you make. You see things in these dies and stamps that I would never think of and it's so inspiring! Just STUNNING! Gorgeous, Sankari! Love everything about this - you are definitely the queen of scenes! BEAUTIFUL! I agree with Stephanie... you make a mean scene! Just lovely. I love your scene. The papers you used and the whole card is just stunning. I love this. Oh how pretty! Love all the bright colors and especially the flowers! Let's hope spring is indeed right around the corner! Sankari, this is just stunning!!! WOW! March Verve Diva Inspiration Blog Hop!